For many senior caregivers, one of the most frustrating, and at times difficult challenges they will have to face when caring for a loved one comes when this senior no longer has their same appetite. They may start to eat slower or eat less, or seniors may just refuse to eat all together. This can be a very serious problem and one that can understandably worry any senior caregiver. So, what do you do if your loved one starts to lose their appetite? Unfortunately, this is typically a very complicated problem, and there isn’t always one quick fix to solve the issue. There are, however, multiple different approaches you can take to try to increase your loved one’s appetite and to make sure that they are still getting all of the nutrients they need to stay their healthiest. Start adding fruits and vegetables into their diet. Sometimes, there is nothing that you can do in order to make your loved one regain their appetite. There are, however, things you can do to make sure they are still getting the nutrients that they need. This is why adding as many fruits and vegetables possible to their diet is always a smart approach. Even if they don’t eat a lot, you can still make sure the things that they are eating are actually nutrient-dense. Help seniors get more sleep. When seniors are able to get enough quality sleep every night it can impact virtually every aspect of their lives and their health. If your senior isn’t sleeping enough, it may be impacting their appetite, so the more you can do to get your loved one on a proper sleep cycle, the better. Make eating something social. There are many seniors who simply don’t eat because they don’t feel like it or they forget. If you start accompanying your loved one during meals and making meal time something social, they are much more likely to eat just to fit in and be part of the social experience. Set reminders. If you are really worried that your loved one isn’t eating when they are on their own, especially if they have Alzheimer’s or dementia that may be causing them to forget that they should be eating, set reminders for them. 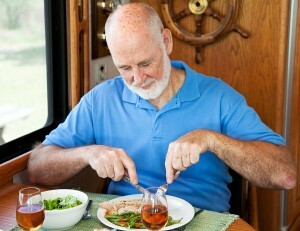 For many seniors, all they need is a little nudge in the right direction in order to start eating more. Visit the doctor to get to the bottom of the issue. If you are worried about your loved one’s decreasing appetite, then it may be time to take them to the doctor for more information. Sometimes, a loss of appetite can be a normal part of aging, but other times it might be a sign of something more serious. Appetite loss can be a side effect of certain diseases and conditions, or it can be a side effect of medications as well. Either way, it is always smart to rule out anything serious when it comes to issues with appetite. Keep these tips in mind when your senior loved one starts losing their appetite, it can go a long way in helping your loved one stay healthy and happy well into their golden years.